Illustration: Sasha Kurmaz, Kiev 2013. 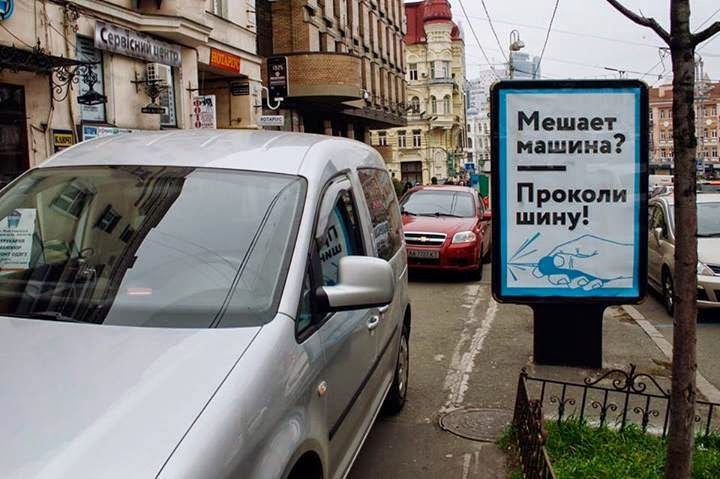 "Annoyed with a car (that blocks the passage)? Pierce the tire"
მოსკოველი ხელოვანებისა და აქტივისტების ჯგუფი Partizaning თბილისში ყოფნის დროს იმუშავებენ პროექტზე „აღმოაჩინე ელიავა“, რომლის ფარგლებშიც ჩაატარებენ კვლევას ელიავას ბაზრობაზე და შეეცდებიან ადგილობრივი თემის თანამონაწილეობის პრინციპზე დამყარებულ ღონისძიებებსა და ინტერვენცებში ჩართვას. კოლექტივი ეპატიჟება ყველა ქუჩის ხელოვანს (street artists), ურბანისტს, აქტივისტსა და თბილისზე შეყვარებულ ადამიანს ლექციაზე, რომელიც ეძღვნება Partizaning-ის მოქმედების ტაქტიკასა და თბილისში მიმდინარე ურბანიზაციის შესახებ დისკუსიას. Partizaning არის კოლექტივი, მოძრაობა და ვებგვერდი, რომელიც ახორციელებს ხელოვნებაზე დაფუძნებული აქტივიზმის, ინტერვენციებისა და მსოფლიოს სხვადასხვა კუთხეში მიმდინარე ურბანული დაგეგმარების ცვლილების მაგალითების დოკუმენტირებას. ჯგუფის აზრით, სულ უფრო ფართო არეალის მომცველი სოციო-პოლიტიკური რეალობისა და უკმაყოფილების შემთხვევების გააზრება ხელოვნებაზე დაფუძნებული “პარტიზანული” ტაქტიკის საშუალებითაა შესაძლებელი. კოლექტივის მიზანია ქალაქის რეგენერაციასა და სოციალურ აქტივიზმში ხელოვნების, როგორც პრაქტიკული ინსტრუმენტის როლის კვლევა, რაც ეფუძნება თანამედროვე რუსეთში არსებულ კულტურულ, პოლიტიკურ და სოციალურ კრიზისს. ის ახდენს მსოფლიოში არსებულ საჯარო სივრცეებში, ქალაქებისა და ადამიანების ურთიერთობებში ხელოვნების როლის დოკუმენტირებასა და ანალიზს. პროექტში „აღმოაჩინე ელიავა“ გეოეარი თანამშრომლობს კულტურისა და მენეჯმენტის ლაბორატორიასთან. პროექტი ხორციელდება ინიციატივის GALA (Green Art Lab Alliance) ფარგლებში, ევროკავშირის კულტურის პროგრამის მხარდაჭერით. ჯგუფის “Partizaning” რეზიდენციაში ყოფნას უზრუნველყოფენ ორგანიზაცია CEC ArtsLink და ფონდი Black Sea Trust for Regional Cooperation. 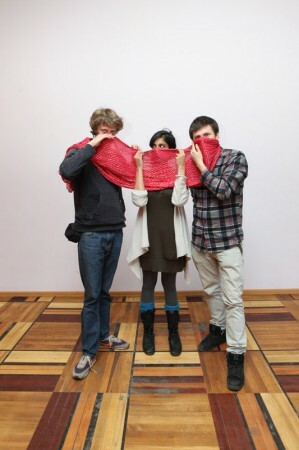 Moscow based art and activist group Partizaning will work on the project “Discover Eliava”. They will focus on research of Eliava market and will working on involving local community in creation of a participatory event/intervention. Group invites all street artists, tactical urbanists, cycling activists and Tbilisi lovers to the lecture about Partizaning tactics and discussion about urbanization of Tbilisi. Partizaning (v): public art practices, which strategically challenge, shape, and reinvent urban and social realities. Partizaning is a movement, a collective, and a website. It documents examples of art-based activism, interventions, and urban replanning from around the world. Collective believes that increasingly shared sociopolitical realities and dissatisfaction can be strategically addressed using art-based 'partizaning' tactics. Aim of the group is to explore the role of art as a practical tool for inclusive city regeneration and social activism. It evolves out of the cultural, political and social crisis facing contemporary Russia. Collective provides documentation and analysis of the role of art in reshaping public spaces, cities and human interactions – globally. GeoAIR implements the project “Discover Eliava” in collaboration with the Culture and Management Lab. Project is realized in the frames of the GALA (Green Art Lab Alliance) initiative, which is supported by the Culture Program of the European Union. The residency stay of Partizaning is supported by CEC ArtsLink and the Black Sea Trust for Regional Cooperation. 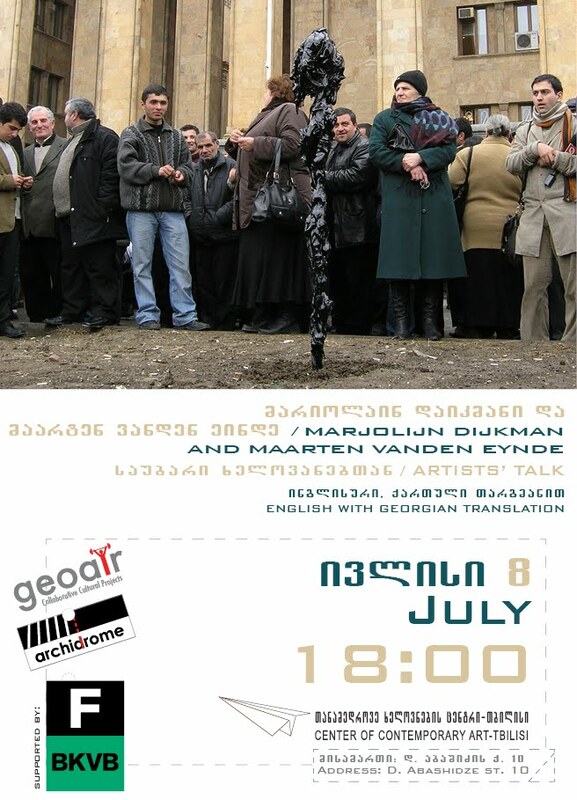 The residency stay of “Partizaning” is supported by CEC ArtsLink and the Black Sea Trust for Regional Cooperations.